Blog reader Paul VonZimmerman told me he has been thinking about the concept of tacit knowledge and how it relates to art instruction. He asks, "What are your thoughts on this as someone who has created a variety of instructional material?" First, a definition: Tacit knowledge is the kind of knowing that is hard to put into words, such as kneading bread dough. The opposite is explicit knowledge, which can be easily transmitted verbally, such as the names and placement of colors on the color wheel. Even an expert practitioner may not be able to consciously explain their tacit knowledge. Therefore it may be difficult for them to pass it on to the student through writing, lecturing, or diagrams. A lot of people use the example of riding a bicycle. People who master the skill often don't know why they turn the handlebars right or left to balance and turn; they just "get" it. 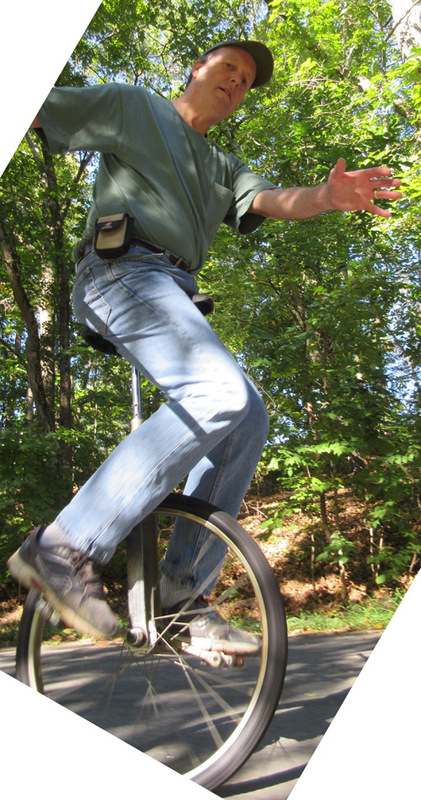 Riding a unicycle is a lot like bicycle riding, but in addition you have to apply pressure on the pedals to balance in the forward/backward dimension. In the case of art instruction, I agree that there are topics that can be transmitted more easily through writing or explanation. Those topics, such as perspective, principles of lighting, theories of color, and strategies of composition, can be taught naturally in a book or a classroom setting. They lend themselves to being analyzed and explained in words and therefore they're suited to transmitting reading or watching a lecture. I focused more on those topics in my books Color and Light and Imaginative Realism . Learning to paint involves a lot of practical skills that many artists find hard to explain. These skills include color mixing, paint application and stretching a canvas. These topics apply naturally to workshops or videos where you can watch someone doing the action, hear them explain why they're doing it, and then practice it yourself until it starts to become automatic. One reason I love producing instructional videos is that I can film the whole process as I create a painting, and then in the voiceover, I can verbalize my thinking at each stage. I have done live demos where I explain what I'm doing in real time, but unless I'm demonstrating the same skill over and over, I feel I sometimes have to compromise either the explanation or the painting. To answer your question, Paul, I don't really like the idea of dividing knowledge into fixed categories of explicit or tacit. The problem with the theory of tacit knowledge as I understand it is the presumption that some skills can't be verbalized. I believe any skill can be explained, especially if it is broken down into steps. Moreover, it must be verbalized, especially at the beginning, if the teacher is really doing their job. Sometimes teachers verbalize surreal images that help students learn a skill. I heard an equestrian instructor tell her students to imagine a beam of light coming out of their belly buttons and shooting forward between the horse's ears. I suppose it worked better than saying "Sit up straight!" I learned to ride a unicycle by reading a book. I didn't have a teacher and I didn't know anyone else who rode one. The book broke down the process into a series of steps that I could master one by one until I "had it." Copying from classic illustrators is a great way to turn appreciation into practice. 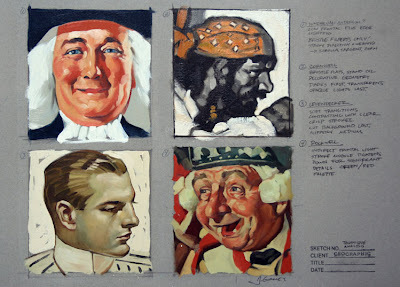 These are my copies of Sundblom, Cornwell, Leyendecker and Rockwell. When it came to learning art, I never had a formal painting teacher, nor did I watch any art videos when I was first learning. Until I was in college I didn't know any other artists. I learned everything on my own through reading and practice starting in elementary school, so I'm a great believer in the power of the written word. Rather than conceiving of the universe of learning as divided into two groups of knowledge, tacit and explicit, I think it's more useful to look at learning—especially "motor" or muscle-based learning—as a process of internalization. New studies of the brain have shown how conscious knowledge is gradually made automatic as the neural pathways shift from the outer cerebral cortex to deeper networks in the brain. The theory of motor learning is a rich subject, but let's save it for another post. In the comments, I would love to hear from art teachers about how you teach various kinds of art knowledge, and from students about what what kinds of teaching has helped you the most in learning to draw and paint. I am actually still a student, only going into my third year as a painting and drawing major, but I have adopted a younger artist who I've started to occasionally mentor. I too developed my skills in technique and style on my own, so the last thing I would want to do is impose my very personalized skills on someone else. I instead am leading her to develop her own arsenal of processes by teaching her about practice/sketchbook work ethic, studying the styles of many artists from a variety of mediums, observation from nature vs. imaginative work, etc. It's more about learning how to be a productive and self-improving artist than how to learn any specific skill (though her technical skill has improved exponentially over the past few months). I taught myself how to ride a unicycle without a book or a teacher or anyone. In fact I taught myself by getting up, going for a second, then falling down. I did it over and over again until one time I was able to continue riding. The same is true for art. I did go to college for art but they didn't teach anything. What the instructor did was say, "Here are some things in the center of the room on tables-- paint them." We then painted them. The instructor mainly spent his time up in his office on the third floor smoking pot with female students. After we painted them, we had critiques. I use that word loosely. These mainly consisted of putting one of our paintings on an easel, gathering around on our little art stools, and then being asked one by one to tell the class what we thought of that artwork. Of course, it was crap. But, since the instructor was unwilling to tell us how to paint, or what brushes to use and why or how, or how to stretch canvas, or literally how to do anything related to the art of painting, we were on our own. We would say things like, "Well, I kind of like it." Or, "I kind of think it doesn't work." In other words we didn't even have the vocabulary to discuss the paintings in front of us. After having spent the entire semester painting as much as eight hours a day, I had managed to create some 35 paintings. During that time, I experimented with various techniques and styles. I did that because there was no effective instructor. When it came to the final critique, our instructor finally decided that he would provide a critique. My body of work was large enough that I had to set up a mini show in an adjoining studio. I remember that day very clearly. We walked into the studio--the entire class and the instructor--and he looked around for about 15 seconds and said, "You are too scattered in your technique you need to focus on one thing and do it for the rest of your life." He turned on his heel and walked out. I quit that school. Everything I learned came from books and from copying. Had I known back then in the late 70s that there were ateliers out there in the world, I would have done everything in my power to attend. I think there are many of us who went through that during the dark days of modern art. I still paint. I've done about fifty commissioned portraits in the past year. Finally, I love your blog. I read every entry. Your conversation at Suggested Donation was excellent! Keep up the great work! Thanks for the insight, James. I regularly give Art training for the video-game industry, in a very specific domain (Level Art). I encountered a lot of people who believe that a good training could be enough to turn fresh artists into seasoned professionals. In my opinion, artists can only be considered "ready" after going through a whole project (which in my field means a few months to a few years). Transmitting explicit knowledge is great to give an idea of the workflow or avoid the most common pitfalls, but field experience is the only way for artists to ask themselves the right questions. James, recommend, as continued professional development, you familiarize yourself w/ General Semantics. The discipline's founding father, Alfred Korzybski, published a book earlly 20th century titled 'Science and Sanity' - a challenging tome. A condensed version, 'Selections From Science and Sanity' is equally challenging. More coherent (and useful for practical application) is John C. Condon, Jr's 'Semantics and Communication' and S. I. Hayakawa's 'Language in Thought and Action.' A diciple of this field of study for 35+ years, still it impacts my painting and takes it (and life) in new directions. To preclude any false assumption, semantics is the study of language whereas General Semantics is the study of how language (any language including symbols) influences human perception, thinking, and behavior. Think of painting as a language. I'm a middle school art teacher (7th & 8th graders). I love your blog! I have 5 50 minute classes a day (this semester an 8th grade gifted class and 4 mixed Art 1 classes). I tell the kids that art is like playing a sport or learning an instrument or anything else...you have to practice it. Each kid has their own sketchbook and we spend the first 10 minutes of class doing a "warmup". Some days it is drawing a quick still life on their desk, or having a kid pose for a quick figure sketch, or maybe create something from their imagination). 6) paint the fish. whew! I do the project along with them, and have examples they can see. I think it helps to see that their teacher can do the project, and by breaking it down into manageable steps they can handle it without being overwhelmed. We also do a weekly homework assignment on the art elements and art history. Critique is another fundamental part of the learning experience in my classroom. Learning to see and express what is working, what is not, and why, is a very important part of the educational process (not to mention simply learning how to accept and employ criticism). My thoughts may be a little random, but hopefully on topic. BTW - I love the videos, books, blog posts, etc that you have created and have learned a great deal from you. And it isn't just the specific topic you might be teaching (though they are always interesting), but the model you demonstrate of a love for learning and a never ending desire to grow and explore. Please keep doing it! Thanks for the great post James! I have been an art teacher at a continuation high school for almost twenty years. Most of my students are at my site because the comprehensive schools have failed to meet their needs. They are wonderful kids but they come to me with with an incredible range of attitudes, maturity level and prior knowledge. A great deal of my day is spent dealing with issues that don't really have that much to do with art. I do a LOT of counseling and coaching of interpersonal skills. When i am teaching art I teach painting drawing and print-making. My students are convinced that drawing and painting require innate talent. They believe that if they don't already possess that talent, that trying to learn those skills is a waste of time. Consequently I spend a lot of time trying to break down what I know to be an erroneous belief. It's kind of sad that my high school aged students have been conditioned to think that they can't do something as simple, fun and satisfying as drawing! I have found that my screen printing program is by far the most popular thing I teach. I think that is because it is so process intensive. There are a lot of steps but learning the steps and repeating them seems more doable to my students than learning how to paint or draw. It is wonderful to see how inventive my students get with the screen printing process once they have learned the basics. The unfamiliarity of the process is its big advantage. No one has told them that they can't do it yet. In my own experience I have found that the handful of skills that I am passably good at have required lots and lots of thoughtful practice. On a few occasions I have also had the benefit of some truly first rate instruction, but that instruction would have been nothing more than an interesting waste of time if I had failed to follow up with personal practice and experimentation. Each of my students is different as to how they learn most efficiently. I focus on cultivating an environment rich in motivation, community, and inspiration...so that each one of us has the opportunity to discover accelerated paths of development. Know your goal and evaluate your efforts accordingly, is one of the core ideas I aim to exemplify. I encourage the students to question everything as I demonstrate different strategies and techniques of working. We draw from observation, study and copy master works, and feed our imagination through curious research both online and in the "real world". Its a challenge to keep young minds engaged as short term stimulus is abundant these days. I aim to surprise constantly. When things are working the room is buzzing with energy, and I am shoulder to shoulder with my students, fully engaged, learning just as much. In Scandinavia we have something called "Silent knowledge". It is the part of any skill that can not explained by words or pictures. It appears when you have done it for a while and it flows automatically. I teach workshops, write articles and books, and also do videos. I find that each of these have their place in the world of art instruction. Most things I can explain verbally in speech or in words. If the concept is complicated yet can be broken down into simple steps and thus explained easily, this is for me the best format. (I am very comfortable with words as a former English major!) Other things I find easier to explain through a visual demonstration, especially if it is particular brush stroke that is just easier shown than talked about. I teach mixed age classes after school, my classroom shares space with a chinese martial arts school, so I am always learning teaching techniques from those guys. My classes are 3-7 year olds drawing, 8-12 year olds drawing and color pencil, 13-adults drawing color pencil and watercolor. sometimes the classes overlap. I try to do two things, one is technique and the other is mental/emotional approach. The mental approach aims to have students collaborate and have fun drawing, so they don't end up as "I can't draw" victims. My favorite approach is the old exquisite corpse drawing- each artist draws a third of a figure, blind to the others' section- and then I have students pick a favorite and all draw a new drawing from the three part one. I do this every two-three months. it really helps bind the class together so their critiques are kinder and more thoughtful, and they can really relax and draw more comfortably. It's nice to see a pigtailed, gaptoothed seven year old and a hulking brooding fifteen year old giggling over a chicken-headed ballerina with tentacles for legs . I developed this approach after watching extremely mixed age kung fu classes play soccer together to relax and learn teamwork and trust. As for teaching technique, really the only approach that works is practicing, right? but students want to see progress. So I like to spend four weeks on a single drawing subject- this month it's goldfish in water from life- and I teach the students different techniques to get the image down. pencils, markers, markers with water and oil pastels and a combination for the youngers, charcoal, colored pencil and watercolor, also mixed media for the olders. Use of the different materials gives them a chance to release the stress and pressure of learning to work with these different mediums, while training their eye to see the essential nature of the subject. In the end of the unit they have a number of drawings and paintings to show, improved confidence, material and drawing technique, mental and artistic flexibility and a deeper understanding of a subject. I also borrow this technique from martial arts teaching- multiple approaches together gets the desired result. There are a hundred ways to develop balance, they practice cartwheels one day, jumping on one leg one day, walking on the hands another...then one day a student realizes they can't be pushed over by anybody and they never seem to fall down on the playground anymore. interesting. teaching art is so difficult. Lately, i am coming back to stressing the importance of talent. I think talent simply mediates the speed people learn with some people managing to paint within a year. However, master copies are probably among the prime things you can do if you have a certain skillset. Von Menzel only started oils when he was in his 40s ,i think. btw:What does "transparent,opaque lights last" mean in the copies? I thought that was a contradiction or is that some personal vocabulary? Interesting post and great discussion in the comments as usual. May I ask a technical question about your instructional videos (all of which I have and love)? When you record yourself painting, it appears that you try to speak very little and record only the sounds in the environment to leave space for the instructional voiceover. How do you handle conflicts with the voiceover if you made an inadvertent comment in the video, or are you just practiced enough now to avoid doing that? I think a great deal of "tacit" knowledge can be transmitted by having the student do the thing as you talk them through it. My mother taught me to make pie crust that way. She gave me the recipe and then she stood next to me while I made the dough. So I could feel the right consistency. So I could see the point where she wanted me to stop working the dough. She took some of the dough out and made me make mistakes with it, so I could feel and see what it was like when you went wrong. Hey, James. First-time poster, but long a fan of your blog (and art)! Although I have taught in the past, I don't do that now. However, I've been thinking about this, and I think that art is a bit like yoga in many ways - you need to get the basic foundations down first, then the more difficult things seem to "just happen." For example, it's hard to make a successful painting if you don't understand the basic concepts of composition, tone, etc. Once you are able to successfully demonstrate them repeatedly, then the painting as a whole seems to happen so much easier, and sometimes, almost like "magic". I think that's why it seems like the knowledge is difficult to explain. I do think that there are some things that are simply learned through repetition (and good ole practice), like baking bread or cooking, that seem hard to explain. When cooking something that she is not familiar with (and I am), my wife often asks how long it should take to cook, and I reply "'til it's done!" However, I do believe that there are always words that we can use to describe these types of situations, but sometimes it's very challenging to find the correct ones. The best teachers are able to find the correct words. Thanks, everybody. I love getting all these perspectives on learning and teaching. Sara, that pie crust example is perfect. Your mother was a great teacher. And you bring up an important point, which is the importance of having the space to make mistakes and take risks. One of the most valuable things I learned early on with unicycle riding is how to fall off safely every time, which made me fearless about trying to ride it. Carole, that's a perceptive question. While I'm actually painting, I record the contact noises of the art tools, and I record separately extended audio segments of field ambiance. I usually record some kind of on-camera comment to anchor the voice to my face, so it's clear I'm the person talking during the voiceover. Of course the main VO is recorded later, but it's in present tense, so it kind of represents the thoughts inside my mind as I'm painting. Gyrus, I think I meant to say transparent darks first, opaque lights last. Maia, thanks for that wonderful explanation of your method. Those kids are lucky to have you teaching them. When I was briefly a student my oil painting class seemed to leave me hanging in regards to a clear process of capturing the still life in front of me....I sort of went with the flow of things and did my own thing, probably out if ego too :(. There were basic guidelines of working in layers, and I was told to first paint in muted tones (didn't reallly understand that then), saving the darks and lights for the final touch, but that was about it....or maybe I wasn't paying enough attention. Regardless those concepts didn't mean much to me at the time and I guess I didn't ask enough questions. Five years later, mainly self taught I now know more of what I wish was being clearly spelled out and taught then in my class. In terms of creativity and expression ...I imagine those things can develop more intuitively as you go on....but in terms of a accurately capturing a scene with paint and color I find myself learning much more from Harold Speeds detailed written account of the painting process than the loose guidelines I got in a college course. But too be fair my cup wasn't very empty at the time and maybe I wasnt listening close enough :). I feel that clearly explaining either in text, person, or by demonstrating how to draw a thing and or how to paint a thing can absolutely be done and should be done, my suspicion is many that are teaching don't have a clear sense of it themselves....which is fine if it gets you results I guess but not too teach. The individuality of the Art is something that seems like a much more organic process and would benefit from more loose guiding lines. I have a fair amount of experience teaching workshops, classes and private lessons. I've learned what I know about painting through taking workshops, reading books, watching videos and teaching others. I think I also have a reasonably high degree of verbal skill. But I can tell you that, whether it be in the context of my own painting or in helping students, there are moments when I only know answers to problems intuitively. Those instincts, if you will, were honed by study, practice and looking at others' paintings. But there is always the occurrence, in my work or student works, of moments where I can only solve a problem with a brush in my hand. I don't know what exactly is going to happen when the brush moves but I have a fair amount of confidence the problem will be solved. I believe that at its essence, painting is finding good solutions to difficult problems. The operative word in that sentence is "finding". To me that implies solutions that are not available on the conscious level. I remember that one professor as I entered college started lessons with limited palettes, painting with 1 color + b&w and then adding colors as the days went. Not surprisingly, I learned a lot about mixing color but very little about developing the image. It was a very controlled and boring method, of which I learned little. In contrast, another older teacher had us on the first day spend time just dumping paint onto sheets and feeling it with our hands. Lessons from him would be challenges such as drawing only with tangent lines, painting with a 3 foot length brush, or coming around class to hand us different materials halfway through a work- beginning each with a demonstration of him doing the practice. It is with these lessons that I learned most, training my muscles and mind with different abstract ways of seeing and understanding a surface or media and how they interact. It made me unafraid of diving in and confident in my own abilities. I am a retired teacher and was an integrated arts teacher for elementary students for 13 years of my 35-year career. However, I want to draw on a different part of my teaching to contribute to your discussion that was sparked by whether there is learning that is difficult or impossible to transmit. I trained as a Reading Recovery teacher and eventually also trained teachers in this early intervention, which features one-to-one evaluation and teaching of the lowest-performing first graders in a school. Teachers are trained to accept responsibility for learning that fails to take place, rather than"blame" the student, which is the norm in most teaching. They are trained to be continual learners themselves in order to stay creative and fresh in their commitment to teaching the lowest students. 1. For teacher-assisted learning, it is the shared relationship around learning between student and teacher that allows the struggling learner to make connections and accelerate learning. (We could call someone who thinks they aren't creative, or who thinks they can't draw "struggling" in an art class, couldn't we?). Several teachers above mentioned learning right along with their students. 2. Being unable to explain something so a student learns is more about the teacher's limitations than about the lack of student ability or the misconception that there are certain things that can't be taught. I have seen absolute miracles in the field I'd Reading Recovery when teachers refused to accept the idea that there are things that just have to be absorbed, and that some students just don't get it. 3. So I understand that there is tacit knowledge, but I have proof that teachers can and do find ways to overcome the difficulties of exposing tacit knwledge to the learner. It all depends on how willing and able the teacher is to be committed about finding new pathways and staying learners themselves. You've got some great examples above of art teachers who are creative, thoughtful, and persist in pursuing success for all. 4. Demonstration without a lot of words, and demonstration that includes clarity of thought as to "why" as well as "how" is often way more effective than explanation alone. 5. Practice is important, but guided practice is even more effective for accelerated learning in many cases. 6. Teaching something does not guarantee learning unless the student can access the teaching and participate in the learning. "I taught that, but they didn't get it." Examine the teaching. Make the implicit more explicit, try focused demonstrations, and don't give up! 7. Some people can learn in a self-guided way, but others need a strong, committed teacher to get over the humps. Blless al the teachers out there, who go the extra mile, are learners themselves, and who refuse to believe that there are just some things one can't teacher, or the corollary, some students who just can't learn! I love your blog because it makes me think deeply about all kinds of things. Thank you! I was on an art workshop where on the fifth day the tutor got so frustrated at not being able to shift one of the participants out of their comfort zone that they took the large watercolour they were working on and poured black ink over it. Not sure what style of teaching you'd call that, but certainly memorable to everyone in the group. To their credit, the person then worked with it, and the result was atmospheric and intriguing.